Are looking for an electric mountain bike with a great track record? 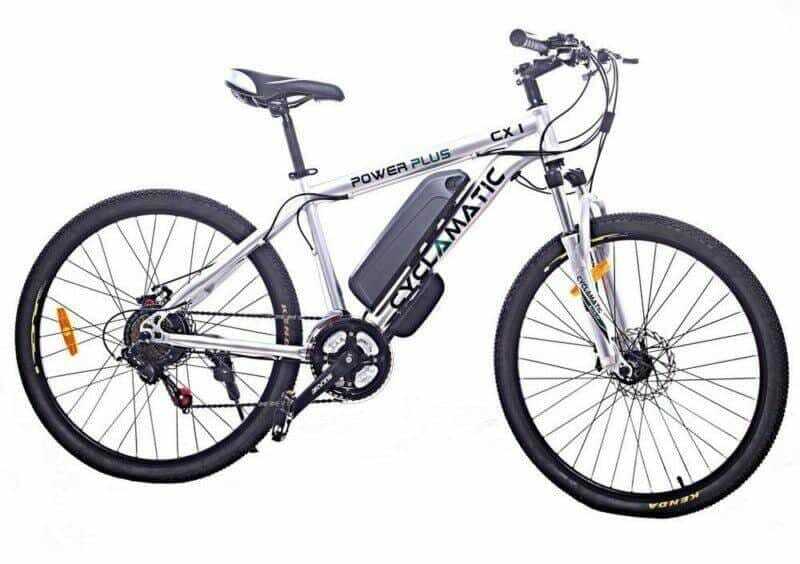 The Cyclamatic Power Plus Electric Mountain Bike is for you. Whether you are a newbie or pro to mountain biking, the Electric Mountain Bike will go the distance in providing a memorable riding experience to you. The 17-inch frame is ideally suited for riders between 5 ft. 2 inches and six ft. 2 inches. This Cyclamatic Power Plus Electric Mountain Bike Review will help you make an informed decision when you decide you purchase the best mountain bike on the market. The new lithium-ion battery offers more power while weighing a fraction of the traditional lead-acid battery. It provides up to 27-mile range with one charge, under favorable riding conditions. The battery has a very low self-discharge rate while it doesn’t suffer memory effect. The battery provides an upgraded power output of 24 volts and ten amps, which is considerably better compared to the commonly used 8A batteries. A battery charge is provided with the product. The battery is fully sealed and safe to use in any weather condition. This will facilitate your ride even on the roughest terrains out there. This Electric Bicycle is designed to make your journey more enjoyable. The electric motor of the bike will switch on, the moment the sensors detect pedaling. The motor will make pedaling easier and smoother while providing total comfort to the rider. When you stop pedaling, the motor will shut off automatically, which will help conserve battery life in the long run. It comes with a 17-inch frame which is quite sturdy and durable. The height adjustable seat can be raised up to 43-inches from the ground. The rider can make adjustments to the height of the bike according to his or her height. The 26-inch rims are made of stainless steel and are reputed for their durability. The rider has some options which he or she can choose from when riding the Cyclamatic Power mountain bike. He or she may choose from manual, full throttle or pedal assistance options. Pedal assistance is the most energy-efficient option since the bike is not 100% dependent on the motor for power. This option will also take some pressure off the rider, which will help the beginner rider as well as riders who are not in good shape. The full throttle option provides total comfort to the rider and is best for uphill rides as well as longer commutes. The gear system of Electric Mountain Bike features 7-speed Shimano gears for quick change. Anti-cling Servo safety brakes provide total confidence to the rider since he or she can stop the bike in seconds in almost any type of weather condition. Q: Can a replacement motor be purchased? A: Yes, there are so many shops that sell replacement motors for this mountain bike. Searching online will help you find most of them. Q: How to remove the battery? A: Turn the key counter-clockwise and push-in. The pin will come back so that you can pull up and remove the battery. Q: Is there a warranty for this mountain bike? A: Yes, the bikes come with a 12-month warranty against manufacturing defects. Consumers have rated the Cyclamatic Power Plus Electric Mountain Bike quite highly. It is one of the best mountain bikes on the market today for the newbie as well as the pro mountain biker. The rider can increase his/her stamina by shifting from the full throttle or pedal assistance mode to the manual riding mode. All in all, the Cyclamatic Power Plus is one of the best electric mountain bikes on the market today.